Last season, Liverpool had one of the most exciting attacks in the Premier League certainly up until Christmas, at which point injuries and absences began to hinder the effectiveness and fluidity of the squad. Jurgen Klopp’s first full season in charge at Anfield certainly lived up to expectations in an attacking sense, with the free-flowing, ferocious football a joy to watch on numerous occasions. However, Liverpool’s attack this season is operating slightly differently yet just as much, if not more ferociously than before. The signing of Mohamed Salah from AS Roma has altered Liverpool’s forward-line and has provided Jurgen Klopp with an alternative means of attacking. Salah moved from Serie A having contributed with 19 goals and 13 assists in his previous season despite playing largely wide on the right flank. In his final season at Roma, Salah contributed to a goal every 94 minutes; a figure that betters that produced by Coutinho (106), Mane (116), Sturridge (119) and Firmino (151). Salah’s high level of efficiency in attacking situations has added to Klopp’s firepower from the previous year, and he’s consequently reformed his forward line to incorporate the threat of the Egyptian winger. At the time of writing, Liverpool have thus far played five matches this season, two of which were qualifiers for the Champions League against Hoffenheim. In four of those five matches, Liverpool’s formation has been a fairly general 433 in possession with an attacking trio that consists of Mane-Firmino-Salah. Liverpool have mustered 13 goals in those four matches, with Mane, Firmino and Salah accounting for 9 of those, so they’re clearly linking up well and operating as the team’s main providers. In the one match this season that Liverpool played without starting that trio, they scored just once in the 73rd minute and didn’t manage to make that breakthrough until Salah came onto the field having started on the bench. Pep summarises the problem with most wingers in the above statement, as although Sterling has a lot to his game and contributes to his team regularly, he still lacks that real goal-scoring instinct. Very rarely do you find a side that has TWO quality wide men with that trait, but this is the case at Liverpool right now. Mane and Salah use different feet, play on opposite wings, and demonstrate winger’s qualities but combine them with a natural sense of attacking movement and the ability to remain composed to finish chances. Salah scored with 18.8% of his shots in Serie A last season which puts him amongst the best converters in the league, and 76% of those shots were taken inside the opposition penalty area which indicates his tendency to drift and lurk dangerously inside. In addition to that, Sadio Mane is currently joint top scorer in the Premier League with Romelu Lukaku and has hit a better percentage of his shots on target than the Belgian striker, with 78% compared to Lukaku’s 60%. Evidently, Jurgen Klopp has signed two extremely efficient wide poachers who are devastating when presented with goal-scoring opportunities and space to exploit due to their remarkable pace and acceleration. This is where Roberto Firmino enters the fray, as his intelligence, tactical awareness and off-the-ball movement provides Mane and Salah with what they need to thrive, as pictured below. 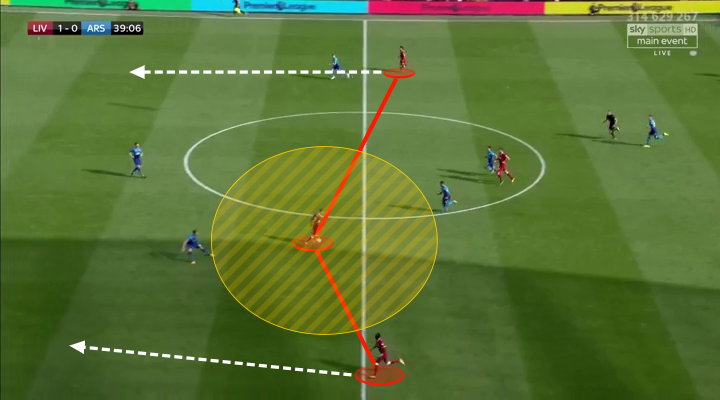 In the image, Firmino has received the ball after dropping deeper and the attention he’s being given has resulted in space being free to exploit ahead of Mane and Salah who both have the ideal characteristics to take advantage of that space, with Klopp of the belief that “speed is the most difficult thing to defend in football”. Firmino is arguably Liverpool’s most improved player since Jurgen Klopp’s arrival, as supporters of the club had previously witnessed him struggle to thrive under Brendan Rodgers, who basically didn’t know how to best use the player and often played the Brazilian out wide. Under Klopp, Firmino has mainly been used in central positions either as a lone striker or as a no.10 operating behind a poacher such as Daniel Sturridge. Now that Klopp appears to have finally convinced Liverpool’s fan-base that the future of the team’s strike force lies with Firmino and not Sturridge, the Brazilian has taken the no.9 jersey and appears to be making the role his own. “It’s not important which players do this, absolutely not important. Sadio Mane could be here *points at CM position*, that’s how it is. Adam Lallana could be here for example *points at RW position*, that’s not important. Phil can be here or can be here *points at LW & AMC position*. This can be Roberto or Sturridge *points at CM position*. Klopp clearly employs a very fluid system tactically and encourages positional interplay providing his players have awareness and are intelligent enough to be able to cover and support each other. Now, although that is still the case this season, the responsibilities and requirements of his front three are somewhat exclusive to Mane, Firmino and Salah, as they’re the only players in the squad with the profiles to adequately produce the perfect storm that Klopp has created. To delve deeper, I’ll look at the individual role of each of Liverpool’s attacking trio to demonstrate how they complement each other and how they combine to make Liverpool’s attack merciless. Roberto Firmino is perhaps the most underrated player in the Premier League, as he’s one of those special players that can make a huge difference to his team both with and without the ball. This season, Firmino has starred in a central striker role that is best describe as a false-nine, as one of his most common movements is to drop deep into the space between the opposition’s defenders and midfielders. By dropping into the space commonly occupied by a no.10, it provides the opposition with a number of problems to deal with in that moment, as demonstrated in the video below. Firmino’s withdrawn movement firstly gives the opposing centre-backs the problem of either retaining their position but thus giving Firmino space, or sticking with him but thus creating a gap in the defensive line behind them. Due to the opponent’s fear and awareness of Mane and Salah’s pace, they often opt against following Firmino which consequently gives him time to receive the ball comfortably, to turn and then either drive forward or play a through ball to one of the lightning fast attackers operating either side of him. Firmino’s movement and execution of the false role is absolutely integral to Liverpool’s attack as a whole, and Mane and Salah wouldn’t be anywhere near as effective without him. Firmino basically acts as the hook between Liverpool’s midfield and attack and is therefore vital when the team are counter-attacking or quickly transitioning. An example of the Brazilian’s importance was demonstrated amply in Liverpool’s recent matches, as they scored six goals in 130 minutes against Hoffenheim and Arsenal, with Roberto Firmino being involved in all six. After three appearances in the Premier League so far, Firmino is currently sitting on two goals and two assists, signalling that he’s playing a striker’s role that is just as much about creating and supporting play as it is scoring goals. Although Firmino is the team’s focal point, he’s prone and given the freedom to receive the ball virtually anywhere on the pitch. The aforementioned positional interchanging that Klopp encourages is ideal for a player like Firmino, who’s natural instinct is to manipulate space, operate with a free role and contribute to build-up play. Below, you’ll see a heat map comparing where Roberto Firmino makes his passes in comparison to Romelu Lukaku. I’ve chosen Lukaku as the comparative example because he’s considered as a more traditional no.9 and will lead the line at Man Utd in a way in which you’d expect most strikers to do so. As shown in the heat map, Firmino virtually has license to roam wherever he wants in order to influence the play and although he’ll predominantly be central, he has orange on both the left and the right of the pitch, signalling that he’s comfortable feeding and supporting both Mane and Salah who play on opposite wings. However, Lukaku’s is largely central with the only orange area of his heat map being in the middle of the pitch which is what you’d expect from a more traditional striker’s role in the Premier League. Also, Firmino’s passing heat map is bolder and more eventful than Lukaku’s, which indicates that Firmino plays more of an involved role in his team’s build-up play and ball progression than Lukaku does for his club. Due to his involvement in virtually everything Liverpool do going forward, I expect Firmino to finish the season with 15+ goals and 10+ assists in the Premier League alone. Sadio Mane primarily plays the position of a left winger but due to the fact he’s right-footed, he regularly has the option of cutting inside onto his favoured foot to shoot. Much like Firmino, Mane has the freedom to effectively drift where he wants when in possession to wherever he feels he can cause the opposition problems. 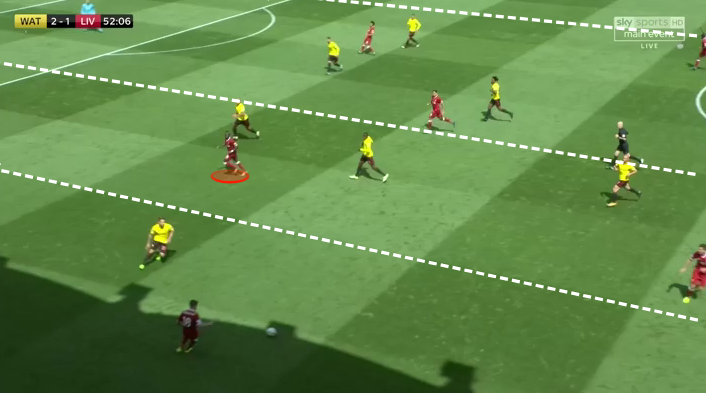 However, when Liverpool are in possession, Mane’s most common location is either on the outside close to the touch-line or in the left half-space as shown below. He’s able to take up this position because Liverpool’s left-backs regularly push up high and as wide as possible to stretch the pitch, so with Moreno/Robertson effectively positioned as a left winger, Mane then drifts inside into the half-space. Mane has more explosive pace and is more powerful over a short distance than Salah, so he feeds of through-balls more often by driving into the space ahead of him that’s been left vacant by the opposition’s full-backs. Klopp’s quick transitioning attack allows Mane to exploit any wide areas that are left unattended by the opposition, so any opponent that plays with attacking full-backs is likely to struggle and be taken advantage of by Mane at some point. With Firmino providing the aforementioned ‘hook’ between the midfield and attack, he’s often the supplier of the through-balls to Mane, as demonstrated in the video below. Much like Firmino, Mane has a somewhat free role and has the freedom to drift around the final third to influence the play but he’ll predominately operate on the left. This is something we’ve seen a lot more of lately due to Coutinho’s absence, so assume his deeper creativity to lessen once the Brazilian is back in the side. I expect Mane to score 20+ goals in the Premier League this season and effectively be last season’s Alexis Sanchez. Although Salah’s role is very similar to Mane’s, it does differentiate slightly mainly because of the natural tendencies of each player. Salah operates almost in the manner of a poacher, and rather than having a free role to roam and influence the play in deeper positions similar to Mane or Firmino, Salah opts to move more directly. Salah’s tendencies mean that he’s much more likely to score tap-ins and have 1v1s with the opposition’s goalkeeper, with a large majority of his shots likely to come within the vicinity of the 6-yard area. Because of Salah’s instinctive striker-esque movement, he’s also capable of playing the role of the team’s centre forward which is currently being occupied by Firmino, and he’s played that position on certain occasions whilst at AS Roma. In the image below, you’ll see a screenshot of the away leg against Hoffenheim in which Liverpool won 2-1. The image demonstrates perfectly the difference between Salah and Mane in terms of their movement and the positions they try to take up for their own advantage. In the image, Firmino has just picked up the ball in that withdrawn area that he’s always looking to position himself within and he’s consequently got space to find one of Mane or Salah ahead of him. Mane is running away from the ball and the goal towards the left half-space to position himself in a 1v1 with the Hoffenheim defender who’s following him. Now, here’s where Salah’s movement differentiates, as he positions himself in the channel between Hoffenheim’s centre-back and full-back and is running towards goal. The significance of this is that Mane tries to isolate himself due to his capability in 1v1s and his ability to cut inside and shoot. On the other hand, Salah is looking to get into the box similar to how a striker would, to pounce on any through-ball from Firmino or any shot/cross from Mane. Although Salah is on the same level of Mane in terms of pace, his 1v1 ability isn’t necessarily as strong with 1.3 successful dribbles per 90 minutes in Serie A last season, so he’s less likely to want to create those situations for himself. In Salah’s first season at Liverpool, I think he’ll be able to contribute massively to his side especially going forward. His instinctual, poacher-esque nature will only benefit him in such an attacking league, so I expect Salah to score a minimum of 15+ goals in the Premier League. To summarise, Liverpool have one of the most aggressively efficient front lines not only in the Premier League but in the whole of world football. Their fluidity, movement and quality combined with their natural instinct to score goals will make Liverpool one of the most exhilarating teams to watch this season. Firmino’s intelligence, Mane’s explosiveness and Salah’s poaching nature ultimately intermix to generate a perfect attacking blend and a nightmare for the most stable of defences. With Jurgen Klopp in charge of the destructive trio, expect Liverpool’s attack to wreak havoc regularly with a total return of at least 50 goals in all competitions by the end of the campaign, especially with Coutinho still to take to the field in his deeper but more creative role.